Revenue Use: KEDVII 1901 issue 2d, 3d, 6d, 1/-. Rarity Scale: KEDVII 1901 issue 2d R4, 3d R4, 6d R3, 1/- R4. Background: Vacuum Oil started operating in the United States in the 1860 and in 1895 became the first oil company to be established in Australia. Up until that time foreign oil products were marketed in Australia via agents. Vacuum Oil first opened offices in Melbourne and they were incorporated in 1904. In 1908 they merged with the Colonial Oil Company and they progressively expanded throughout Australia with offices, processing and distribution facilities in Sydney, Townsville, Perth, Fremantle, Port Adelaide, Newcastle, Hobart and other locations. In 1924 they opened a bulk terminal at Pulpit Point in Sydney. They opened processing facilities in Altona (Melbourne) in 1940 and at Port Stanvac (South of Adelaide) in 1963. In 1930 the US parent company merged with Standard Oil to become Socony Vacuum and later Socony Mobil but the Australian operation remained Vacuum Oil until it changed its name to Mobil Oil Australia in 1963. Device: This Brisbane device is most likely a single die device and was one of 4 similar devices brought into service by Vacuum Oil at about the same time (approx.1907). The other devices were located in Sydney, Adelaide and Fremantle. These 4 devices have been considered to be a single pattern in previous references, but they are certainly separate devices as they have subtle differences in pin location that are consistent to patterns from a single location and what is more the devices have overlapping remote usage. 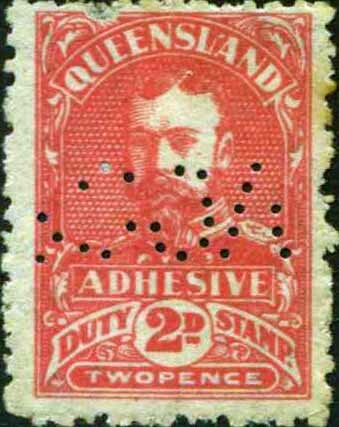 The Brisbane device is found on Queensland revenue stamps as well as the postage stamps of Queensland and later on Australian stamps between 1907 and 1919. 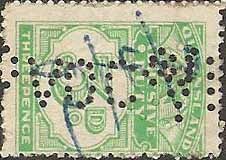 Revenue Use: KGV 1920 issue 1d, 2d. Rarity Scale: KGV 1920 issue 1d R4, 2d R4. Device: This device was located in Brisbane and it seems to have replaced VO/CO.b. As with most other Vacuum Oil devices this was most likely a single die device and it was only used for a short period around 1927. The device was one of 3 (possibly 4) similar devices put into service by Vacuum Oil between the late 1920’s and early 1930’s. These devices were located in Brisbane (VOCO.b), Newcastle, Broken Hill / Port Pirie and later Rockhampton. As is the case with previous studies of VOCO.a, these multiple devices have been considered to be a single device/pattern. This is not the case and although the patterns are very similar there are subtle differences in pin locations that can be seen when you overlay an example over an accurate reference pattern. 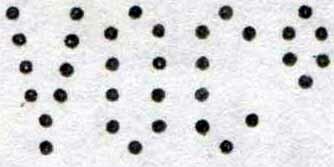 This VOCO.b pattern has not been reported on revenues until this study but it can be found (rarely) on postage stamps of Australia around 1927. The Brisbane device does not seem to have faired well and all usage shows consistent missing pins in the base of the V and the bottom right hand corner of the O. This most likely lead to its replacement by the VOCO.c device. 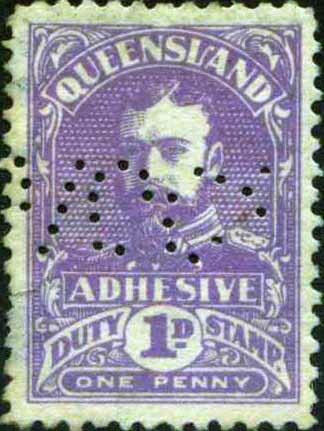 Rockhampton usage of a device making a very similar pattern to VOCO.b has been reported on postage stamps. Given this is later, beginning in 1932, it is possible that this Rockhampton usage is in fact the Brisbane device following modification or repair. KGV 1926 issue 2d R4. Device: This device was again a single head device and was located in Brisbane, replacing the short lived VOCO.b device. 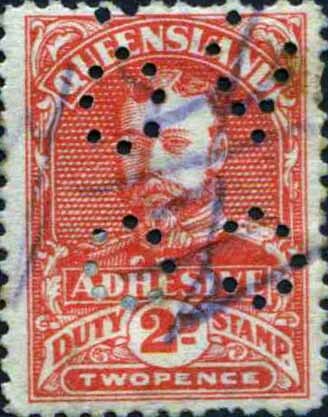 It is found on the revenue stamps of Queensland as well as the postage stamps of Australia in the period 1928-38. On postage stamps Brisbane postmarks predominate but there are some other South East Queensland postmarks such as Kingaroy , Charleville and Mitchell. 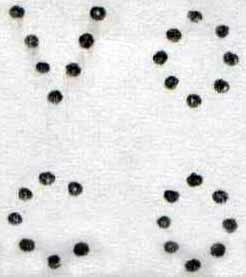 The pattern has thick pins and produces a clear strike. It is characterized by a rather straight sided O and C. In previous studies of this pattern it has been stated that there were two “types” of this pattern. We have not found this to be the case and there is no variation within this pattern. Revenue Use: Numeral 1d, 2d, 2/-. Rarity Scale: Numeral 1d R4, 2d R4, 2/- R4. Device: The device was located in Brisbane and replaced the VOCO.c device. 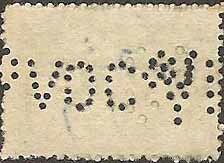 Note the image for VOCO.c above actually shows a stamp struck with both VOCO.c and VOCO.d patterns. The device was a single head format and was one of 3 (possibly 5) similar devices put into service by Vacuum Oil between the 1920’s and late 1940’s. As with VOCO.a and VOCO.b and their related devices these 3 (possibly 5) devices have been considered to be a single pattern in previous references. This is not the case and they are certainly separate, albeit similar, devices as they have clear differences in pin location that are consistent to patterns from a single location. Further the devices have overlapping remote usage. The other similar devices were located in Hobart, Melbourne and two yet to be confirmed locations. 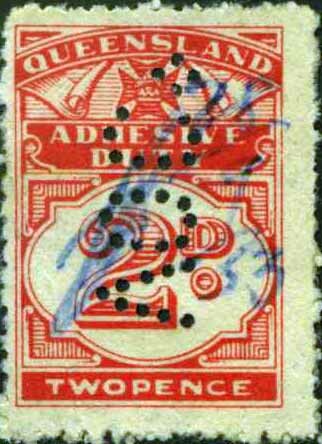 Revenue Use: KGV 1920 issue 1d, 2d, 3d, 6d. Rarity Scale: KGV 1920 issue 1d R4, 2d R4, 3d R4, 6d R4. Device: This device was initially located in the Vacuum Oil Melbourne office from about 1920 and here it is found on postage stamps of Australia. 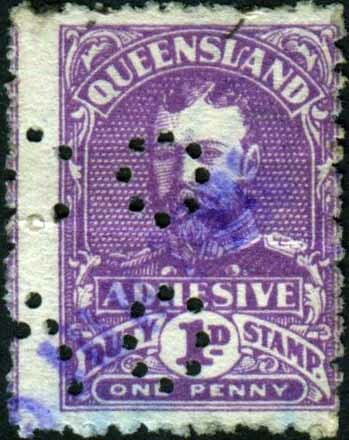 Around 1930 the device was moved to North Queensland, most likely, Townsville where it was used on revenue stamps of Queensland as well as postage stamps of Australia until 1945. Tully, Innisfail, Ayr and Atherton postmarks are also known. The device was a single head format. Late usage shows an increasing number of missing pins starting with the top pin of the O which is not present beyond 1943. 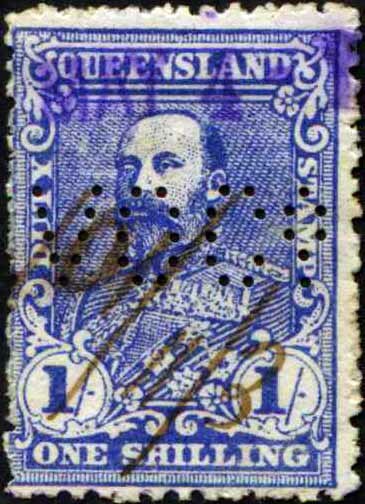 Revenue Use: KGV 1920 issue 1d. Rarity Scale: KGV 1920 issue 1d R4. Device: This device was located in Brisbane and it seems to have replaced VOCO.a. As with most other Vacuum Oil devices this was most likely a single die device and it was only used for a short period around 1923. 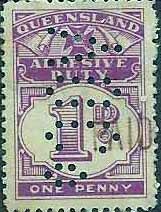 This VO/CO.b pattern has not been reported on revenues prior to this study and indeed it is only found rarely on postage stamps of Australia with all postmark evidence showing use around 1923. This Brisbane VO/CO.b device does not seem to have survived long and may have been the subject of repair or indeed alteration as there is a rare strike of the device, which features thicker pins. This variation is only known on postage stamps and again only in the period around 1923. This device seems to have been replaced by VOCO.b.